Why We Read - Guest Post from A Little Faith. Today see's the first guest post in the featured "Why We Read" - keep them coming folks! Today its the turn of our friend here on Booklikes - A Little Faith. Today is the first of hopefully many guest posts from my reading friends on the joy of reading. Why we Read. Today I welcome one of my BookLikes Buddies – A Little Faith. As a child I believed that the written word was intended exclusively for adults. 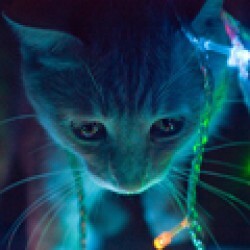 I was alienated from it because I didn’t understand it nor did I like it. It was all too flowery for my tastes, full of circumlocution and elitism. So I spend my leisure time with comics not books, not realizing that I was in fact still technically ‘reading.’ I read everything from action heroes to Garfield, the dark to just plain silly. However as I entered my double digits, I stumbled across Calvin and Hobbes. It was a revelation. It spoke to my soul. It was as though I had spent my life thus far without ever encountering wit. Of course I had but I never before appreciated its cleverness and brilliance. I was in awe. I have this wide pedantic streak that runs through my core. Confessions of bringing me the moon and stars will only result in scorn from me. I’d rather something more honest and thereby inherently more humble. You can’t guarantee to keep me always happy but you can promise to hold my hand through it all. So Bill Watterson’s words were pure genius to me. I’ve never seen irony done better; that exquisite juxtaposition of the literal and the figurative creating a pleasing kind of absurdity. 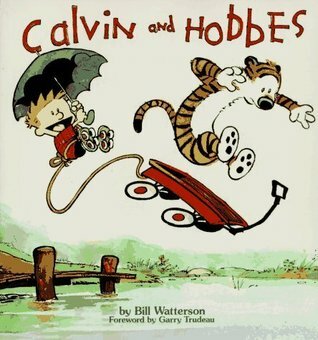 I love the playful conversations between Calvin and his constant companion Hobbes filled with the mocking tone of barbs yet also profundity and love. I didn’t always understand them but I knew that if I sought answers I would be rewarded. Every strip left me wiser and always with a smile on my face. (Don’t ask me about the raccoon…) I always imagined that when he grew up he would follow in the footsteps of Ferris Bueller – that same style of life-affirming impulsive stupidity. Questioning everything – apart from his father – a contrarian by nature because being an outcast, misunderstood or social pariah was nothing if you were true to yourself. Calvin remains a wondrous creation – a character with personality that never ceases to amaze or endear him to you. Eventually at school we began studying Shakespeare’s plays, though I didn’t give it due attention because school was a difficult environment for me, for many reasons and mostly I dreamed of another life whilst in class. However self-study of his plays brought proper appreciation of his art. I found it incredible that something written centuries before could still be relevant to me. I realized that the universal language was not only love but hate, envy, loyalty and in fact the whole gamut of human emotions. However it was the nuanced description of the human experience in Milan Kundera’s The Unbearable Lightness of Being that presented emotions not in the broad black and white strokes of Shakespeare but in the grey void in which we all live our lives. The title is beautiful, philosophical and even spiritual. 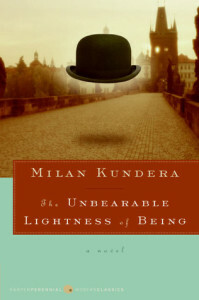 In amongst the rebellion of the all the characters against themselves, people and the world, Milan Kundera weaves in weighty questions about the meaning or meaningless of life. I love that he doesn’t necessarily propagate one answer or message but explores all the possibilities just as I infer he must have thought over, just as the characters do and just as the readers will inevitably. It is his wondrous metaphors that are profound yet simple placing the rebellion of the characters’ action against the question of commitment to each other and fundamentally this life. It is a plot centred on the characterizations so that the mystery lies in the soul and not the thrills of who dunnits. It is about the journey more than the end and I found myself lingering over his elegant choice of words and sophisticated reasoning complete with original analogies. I did not wish to rush to the end to find out the conclusion because I was enjoying the present too much; almost mirroring the message in some respects. Then four years ago I came across the writings of David Foster Wallace and decided to pick up what I wrongly perceived to be the ‘mammoth’ task of reading Infinite Jest. Again, what a wonderful title inspiring wit and immediate interest. His writing is superb combining all the traits beloved to me: wit, semantics, irony with a pinch of playful pedantic attitude. His mastery over his craft is intimidating but his comprehension of the human spirit is magnanimous. It is about the struggle that we all grapple with but above all is about empathy. As Herman Melville said, “Of all the preposterous assumptions of humanity over humanity, nothing exceeds most of the criticisms made on the habits of the poor by the well-housed, well- warmed, and well-fed.” None of us are qualified to serve out justice in just decrees. Furthermore everything we do is tainted by ethnocentrism and the lament of existentialists everywhere! That’s why I now read everything inclusively.